Okay, enough of Japanese food, sweets and food fairs, it is back to good old Malaysian food. 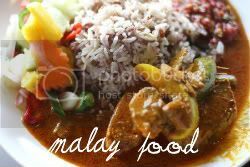 Long long ago, I once contemplated migrating from Malaysia to seek greater fortune somewhere else but at the end of the day, I just couldn't do it, as I knew I'll miss Malaysian food too much. Where else, would I get good food, almost 24 hours daily???? Okay not everything is perfect as our fine dining scene seems a bit pathetic but at least we have great street food to compensate the lack of haute cuisine. I recently had a reason to moosey down town and grab breakfast at one of my all time favourite places - Pudu. I can never go hungry here as there's good food at every nook and cranny - you just have to look hard enough. A place I often visit but have yet to blog about is this infamous yong tau foo joint. Just pick and select from an array of goodies - I love the vegetable selections they have here. 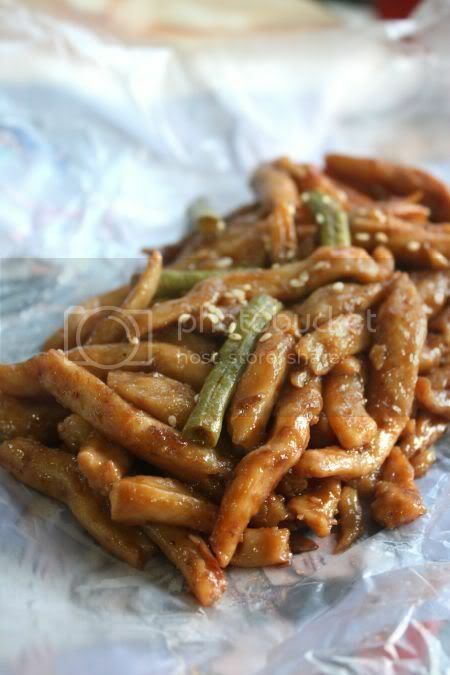 Unlike other places that serve the run of the mill stuff, you get four angled beans and long beans wrapped in fish paste or soybean skin. 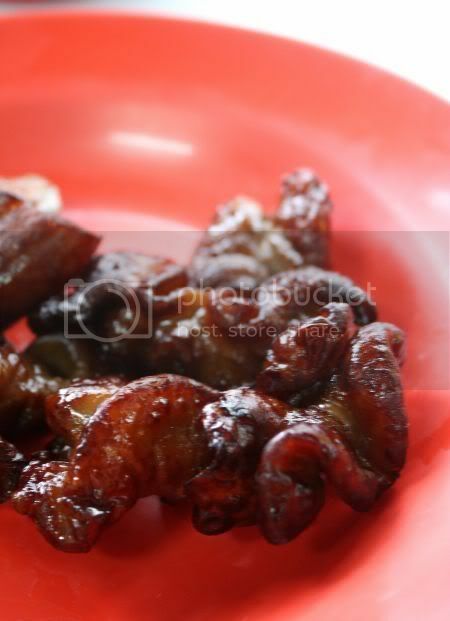 Another point to dine here, is for the sinfully good barbequed pig's intestines. A bite of these dark brown goodies, yields a little but very flavoursome liquid oozing out that hits the tongue just as you are relishing the intestines. Simply out of the world delicious stuff!! While they are not good for the arteries, I try to balance it out with loads of vegetables. Since one can't get filled up with vegetables, fish paste and pig's intestines, I usually eat a small bowl of chee cheong fun with curry sauce. 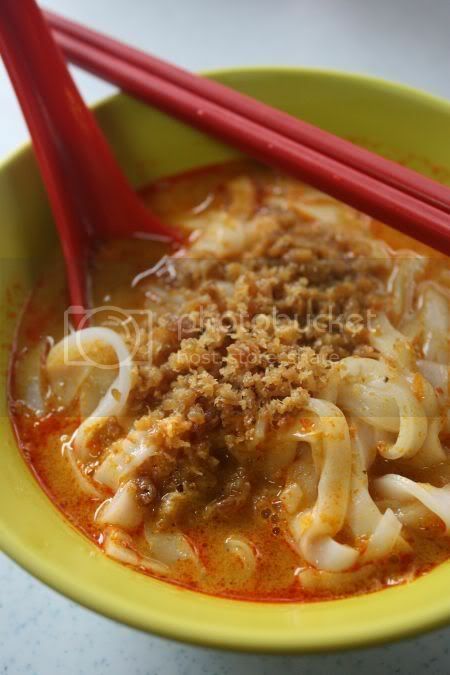 The rice noodles are silky smooth with the spicy curry sauce. While the curry sauce and the dried prawn toppings are not as great compared to Jalan Sayur's fantastic curry chee cheong fun, this version is still pretty good. Everyday is MOF Day! Hmmm, how I wish it was. 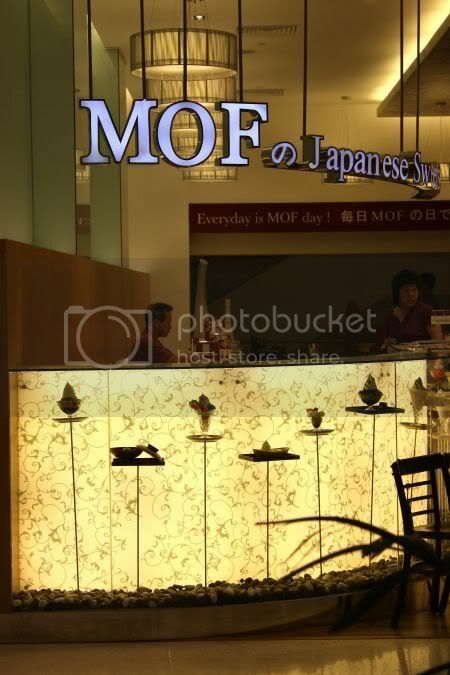 MOF?????? Isn't that the acronym for the Ministry of Finance? Usually it is, but in this particular case, it stands for Ministry of Food and it is all about Japanese desserts and coffee. Apologies to those who are not fans of Nippon stuff, as I just realised this is my 3rd post on Japanese food in the row. Latest place to open at Pavilion Kuala Lumpur - MOF or Ministry of Food, which comes from Singapore. Down south, they're known as Izakayas, serving affordable Japanese food and desserts. Here in Kuala Lumpur, they seem to have changed the concept a bit as they only serve desserts and coffee. Could be due to the stiff competition from other places (Kampachi, Sakae Sushi, Yo Sushi and Ichiban Boshi) that they decided to focus on a niche market instead. 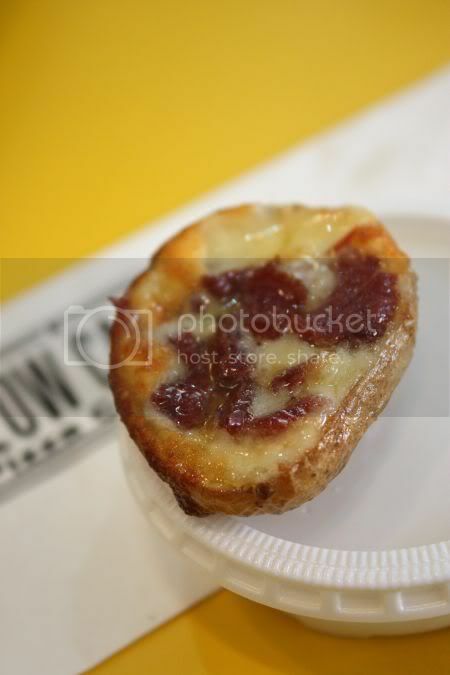 There's loads to choose from the new outlet, right in front of Mercato Supermarket. The place is pretty tucked inside hence if you weren't looking for it, I'm sure you will miss it, since most people usually walk around the middle section. We went on a major blitz to test out their desserts. 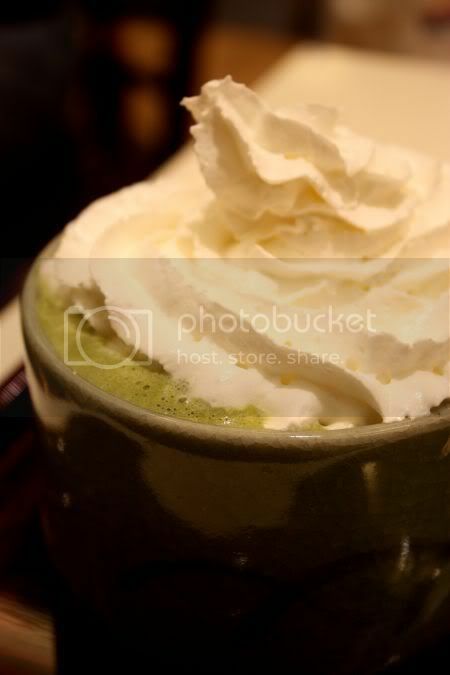 For drinks, I tried the hot Matcha Latte since we mainly tried their cold stuff. Served in a huge clay cup with no handles (hence it can be difficult to drink this when it is super hot), the latte was generously topped with sweetened whipped cream and served with an interesting tidbit called gyuuhi. The latte is pretty creamy and not sweetened. Not sure if you are supposed to add the sugar yourself but I thought the taste was kinda flat, after I ate the whipped cream. 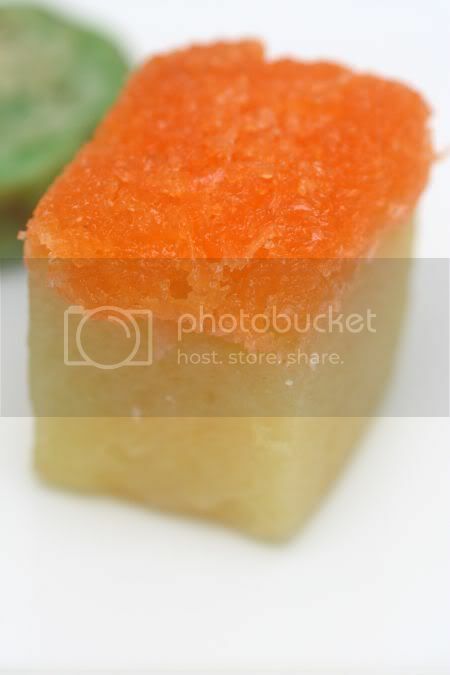 The gyuuhi, kinda reminded me of a not very sweet Turkish delight. 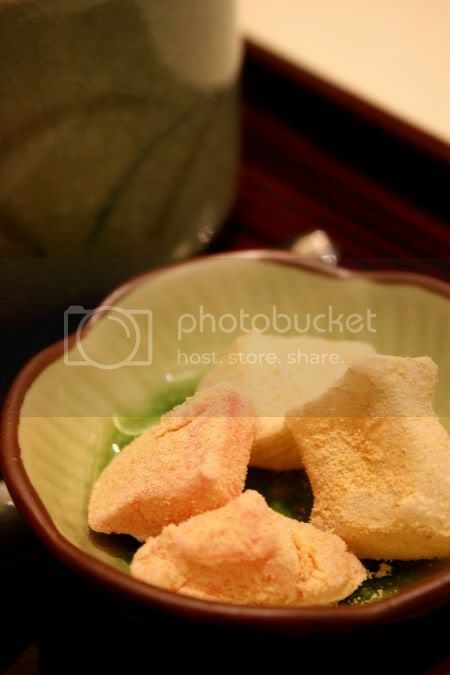 Made from rice flour, it tasted gummy and was dusted with kinako - grinded roasted soybean. The star of the show was the Matcha Imo - their most famous dessert here. Imo refers to the Japanese sweet potato, which was served with soft serve ice cream in this version. Drizzled with green tea sauce and served with red beans, it's seriously yummy stuff (you are supposed to eat all elements together for a sublime taste). We ordered the mix variety (with a yam also) that also tasted good. I love the soft serve ice cream here - very dense, rich and creamy as it is made from Hokkaido milk. Even the red beans are from Hokkaido and it is not overly sweet like some places. 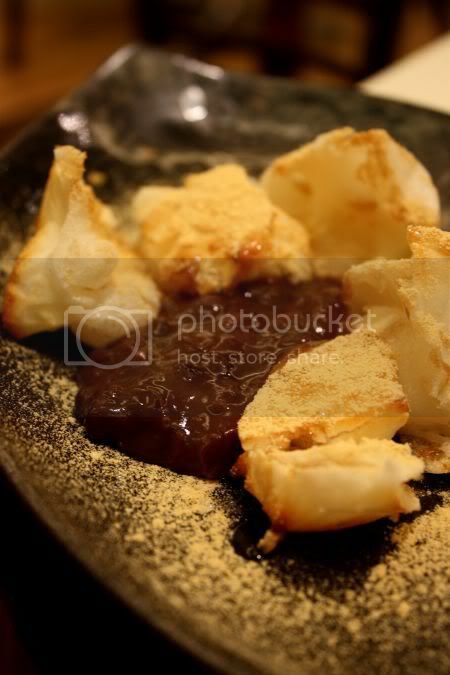 Since everything was cold, we went for a hot item - the oven baked mochi known as abekawa. 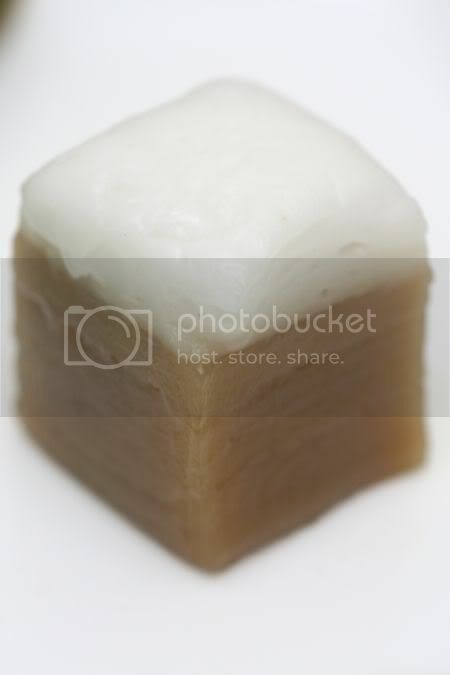 The rice cake is baked until it has a slightly crisp layer outside and a gooey center. The mochi is then sprinkled with kinako. You eat it with red bean paste or if you're feeling decadent, with a scoop of soft serve ice cream. With the matcha flavours covered, we decided to try out the black sesame flavour - the Sesame Sundae, which had kanten jelly cubes, fruits, cornflakes, a waffle, sesame ice cream and soft serve ice cream topped with black sesame sauce. Thumbs up again for this. I love the creamy texture of the sesame ice cream. 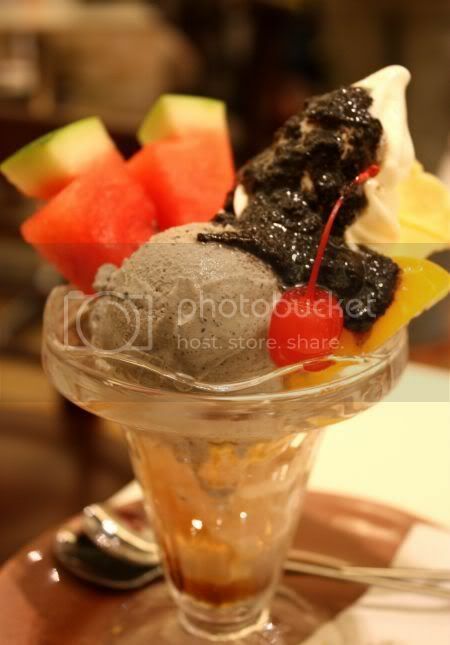 The black sesame taste is not overly strong here and went well together with all the other items. There's loads more stuff on their menu - reckon it will take a few visits to cover them all. Milkshakes look interesting as they are topped with soft serve ice cream and come in various flavours. Coffee, we didn't try any as Splashie Boy hates coffee but I did spy they have affogato with soft serve ice cream. 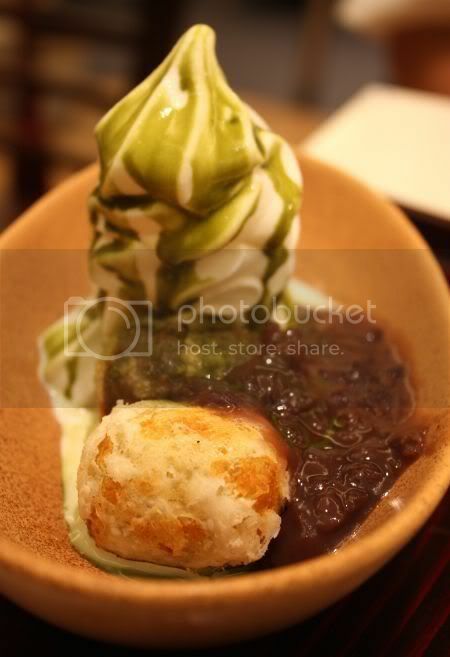 They also have red bean paste served with matcha ice cream and rice dumplings, shaved ice desserts, various types of sundaes, buns filled with red bean paste and etc. If you don't want to sit down, you can always order ice cream from the counter as they serve it with a cone or a cup. Do give it a try and who knows, everyday may end up being MOF day! A quick word about the Summer Hokkaido Fair, now on at Suria KLCC Isetan. If you love all things Japanese, definitely a must. There's souffle cheesecake, butter puffs filled with red bean or custard, soft ice cream with assorted flavours (you can have at least 3 different flavours on one cone), scallops (dried and soft ones with cheese! ), loads of seafood (ikura, crabs, scallops, spicy cod roe and etc), variety of furakke (the dried seasoning to top rice), snacks and etc. This year, there is also a tiny place for you to enjoy cooked bowls of ramen. Good place to have a quick lunch. 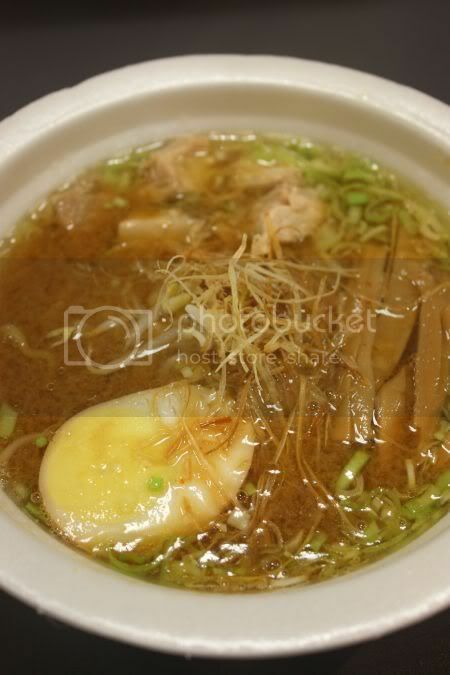 The miso ramen is yummy - chewy ramen noodles with a very rich miso broth topped with half an egg, chicken pieces and bamboo shoots. 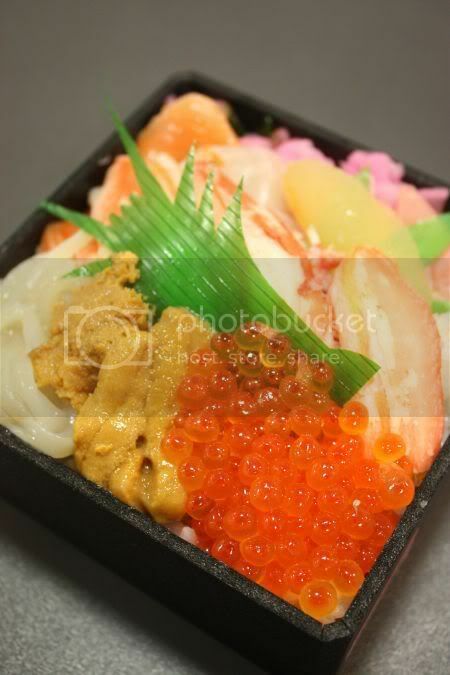 They also have packed seafood lunch boxes with amazing stuff - fish roe, uni, salmon, fresh crab meat, ikura and etc. We were super lucky as we got one amazing deal - RM35 for that lunch box as it usually costs about RM65. Very good stuff! Do visit as it ends this Sunday. The fair is from 11am to 7pm and there are also demonstrations. Certain foods sell out super fast - there's a miso seafood special soup (they only make like 10 bowls of it) hence within 1 hour it can be finished. The Super Dining group has definitely made a mark on the dining scene in the Klang Valley with their Rakuzen restaurants, budget places like Sushi Zen and Sushi Zanmai and their Italian fusion place, Pasta Zanmai. 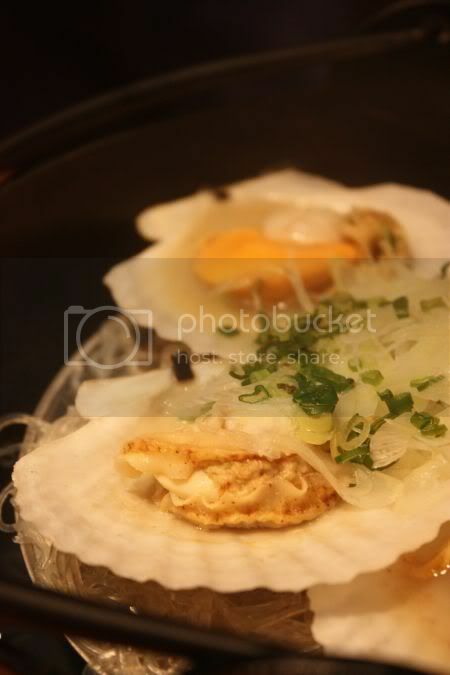 Their latest outlet, Chuka Zanmai is all about the Japanese interpretation of Chinese food. 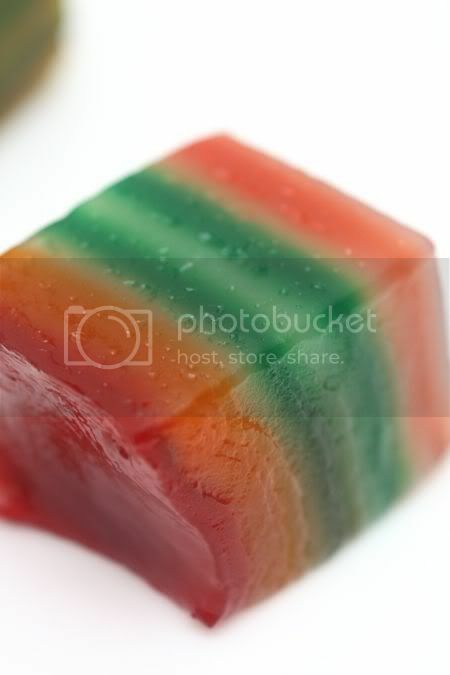 In Japan, this type of food is known as Chuka. 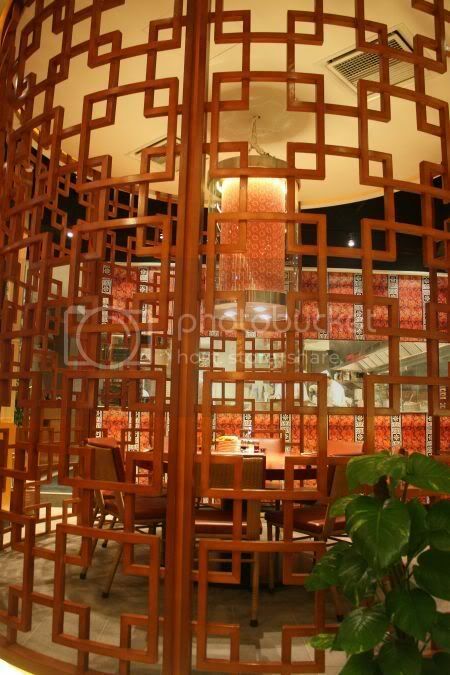 At this newly opened restaurant (they started business on the auspicious date, 8-08-08), you find Chinese elements in the decor and an open kitchen. 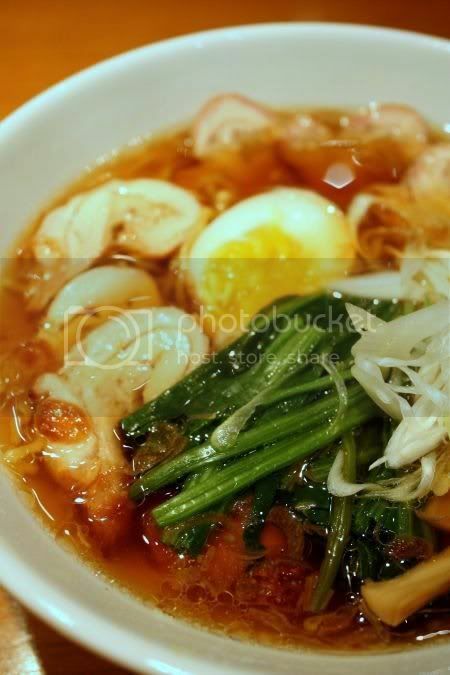 The menu has familiar items like stir-fried dishes, fried rice, ramen noodles in 4 types of soups and etc. 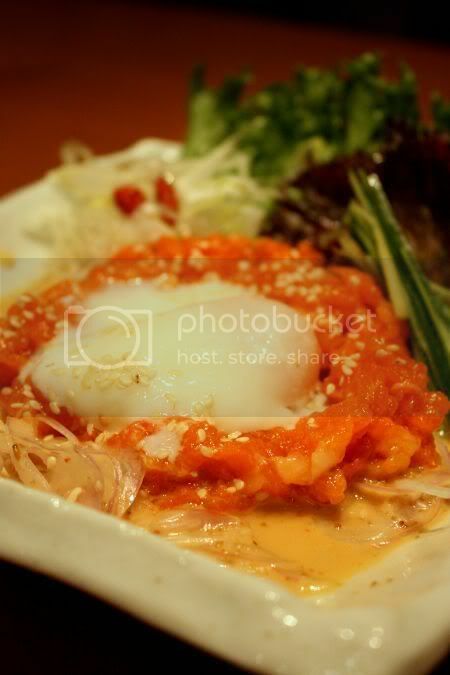 For starters, it was the Salmon Yuke - minced salmon topped with a wobbly poached egg and a diluted sesame sauce. Really yummy stuff that we both loved. I scooped some on a lettuce and savoured the salmon. Unlike the sesame sauce in Pasta Zanmai, this sauce seems very mild. We ordered the stone fried rice, kinda similar to the Korean stone bowl rice with a chicken teriyaki and poached egg. I didn't expect to see the waitress appear to cook the dish in front of us. Before I could say anything, she was busy mixing the rice with the egg amid a puff of smoke. 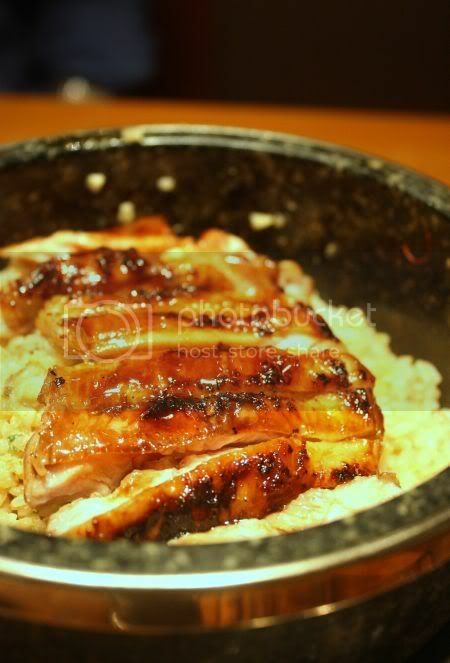 The chicken teriyaki is cooked seperately and placed on top of the rice once cooked. While I loved the teriyaki chicken, we didn't quite like the fried rice, which tasted bland and a bit soft. 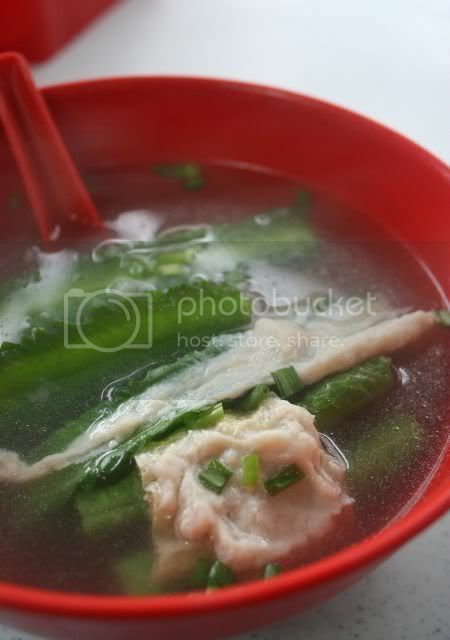 Maybe the next time, I'll order the version with soup, as that should be similar to nasi air from Kelantan. I ordered the ramen noodles. Here you get a choice of soups - shoyu or soy that is the most basic, miso and a spicy broth. There was one more variety but for the life of me, I can't seem to remember. Topped with chicken charsiu (no pork here), it was a bit plain and nothing fantastic. 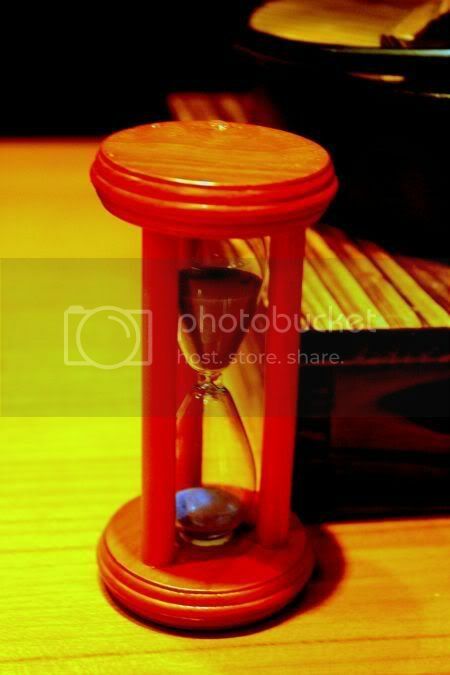 tick tock, when is my food going to be ready??? Instead, I had better fun with the last dish - pan steamed scallops or hotate. Arriving the last of our dishes, this was definitely one of the best. 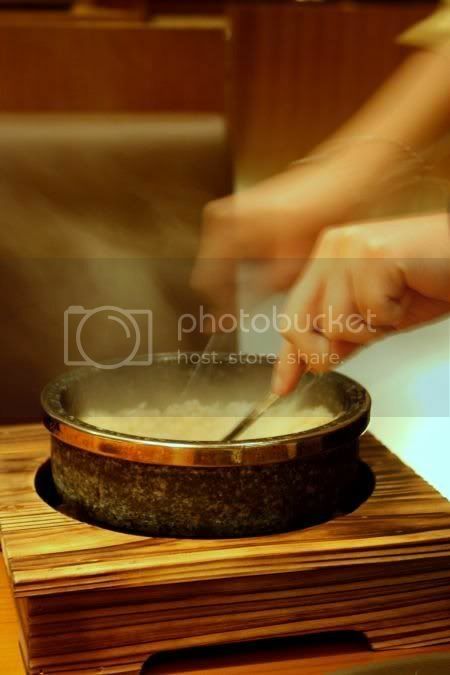 Hot stones are placed underneath the metal pot with scallops and hot water is poured on top to create steam. 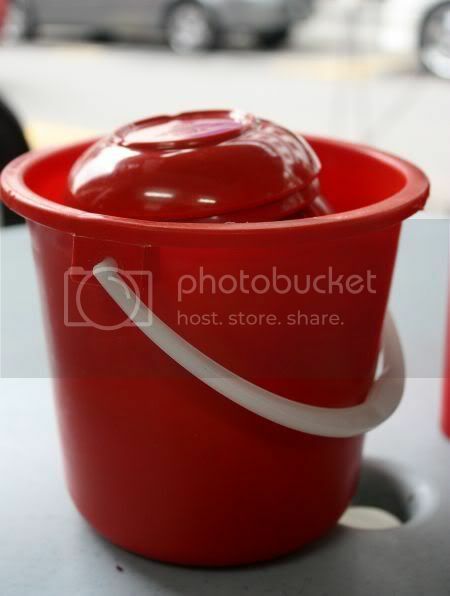 Cover the pot with a wooden cover and you will get a simple yet delicious meal. I especially liked the cute timer they gave us to show the 5 minutes to cook the scallops. The best part of the scallops is the sweet juices that collect on the shell - slurplicious stuff. Overall, we did enjoy our experience here even though it was hard to say this was Japanese since most items are familiar to us. 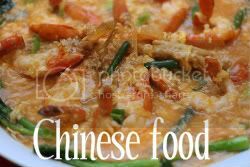 I guess some may say this type of food is not as good compared to a Chinese place but I reckon the group gives their distinct touch to the Chinese cuisine. Note: Visited this place, end of December 2008 and it was closed for renovations. Not sure if this place will still exist or Rakuzen plans to change it into Pasta Zanmai. Call ahead to check if this place is still in business. There's a new bright yellow place in town!! For those who know Splashie Boy well, you will all remember he loves the colour bright yellow. Hence, yesterday when we were driving past Jalan Raja Abdullah, we spied this sunshine yellow frontage. It definitely grabbed his attention, that he even made an illegal u-turn (something he never does!) to check this out. Previously a fishball stall used to occupy this corner shoplot but the owner decided to take the place back and renovate it. The place has been unoccupied for quite sometime, but now it houses this Phillipines franchise - Yellow Cab Pizza Co, where their tagline is "when you want great pizza, call a cab". 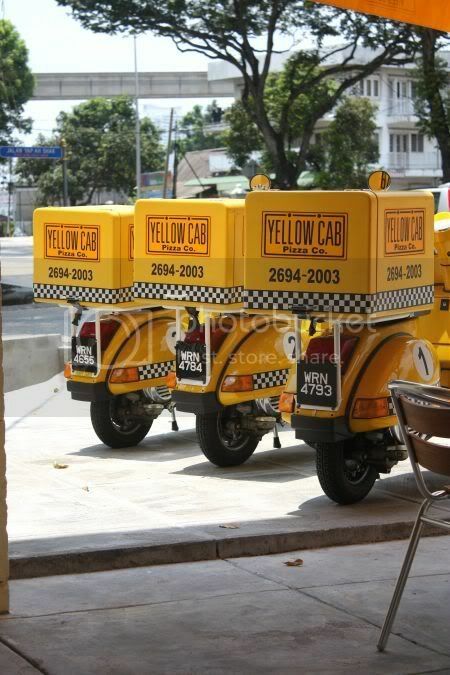 In the Phillipines where they have 54 outlets, they use Vespas for their delivery bikes and a Chrysler PT Cruiser, all painted bright yellow. Wonder, if they'll get a Chrysler PT Cruiser here too? Seen only 1 or 2 around town so far, hence that will be cool. For those who have been to New York, you will notice the references to the infamous yellow cabs. 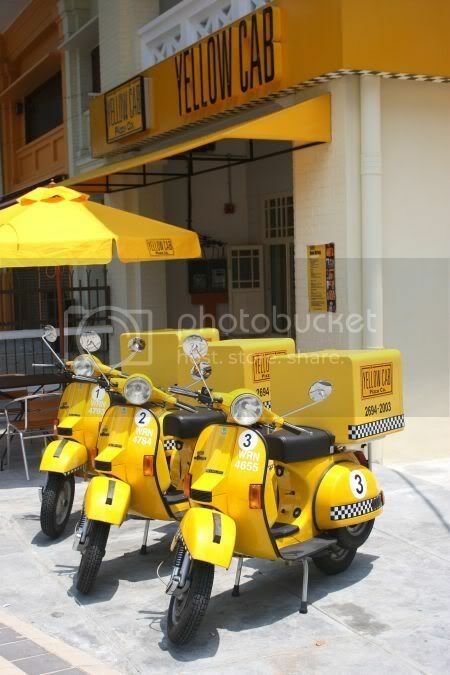 The delivery bikes have been given a sunshine yellow transformation, that they now look like those iconic yellow cabs or taxis, as we label them here. The frontage with the distinctive bikes parked in front got a lot of reactions especially from the tourists who walk past the road. We spied at least 2 groups of tourists who walked past and started snapping pictures. While the old shophouse was given a new lick of paint, glass covered windows as it is now air-conditioned inside, a steel and glass extension that covers a staircase on the side, some of the old elements have been retained like the wooden windows. Inside, there are unpainted concrete walls, bright yellow accents all over, pictures of New York and names of famous places in New York that decorate the place. There's even a cute dustbin (in yellow of course) with metal shelves on top for pizza boxes. I reckon the outlet is recycle friendly, as I saw the worker stacking the boxes on the shelves. You will note the different lengths of the shelves correlate to the 3 sizes the pizzas come in. Thumbs up for this green initiative. Two types of pizza available - classic and specialty. Our menu is similar to the Phillipines one shown on their website with the exception of ice cream and chicken wings. The pizzas come in 3 sizes - 10, 14 and 18 inches. Since we wanted to sample the most from one visit, we ordered the 4 Seasons - with 4 types on one pizza i.e. 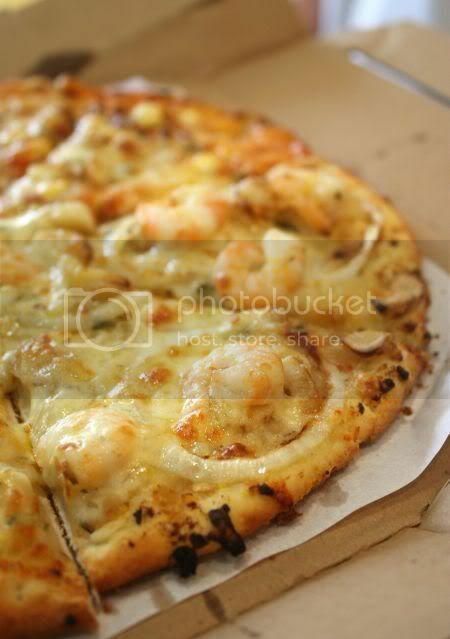 NY Classic, #4 cheese, Anchovy Lovers and Roasted Garlic and Shrimp. 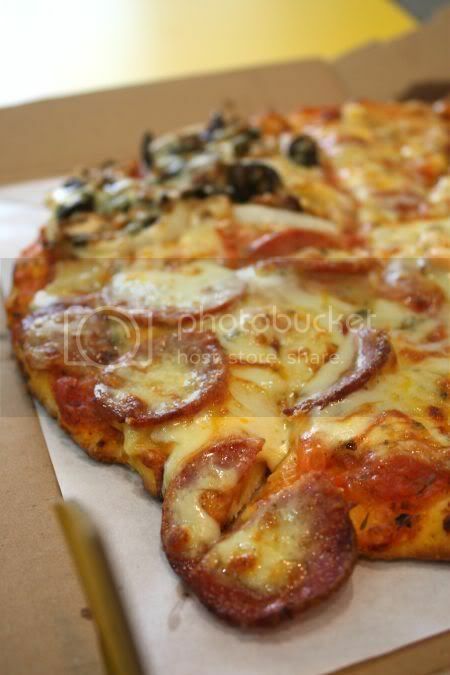 Our absolute favourite out of the 4 types we tried - the NY Classic with beef pepperoni slices. A simple pizza but very tasty probably because they use tasty beef pepperoni. Next favourite was the roasted garlic and shrimp with a subtle taste of garlic and prawns scattered on top. The #4 cheese with romano, mozzarella, cheddar and feta was not bad also but it had a slight sourish taste. 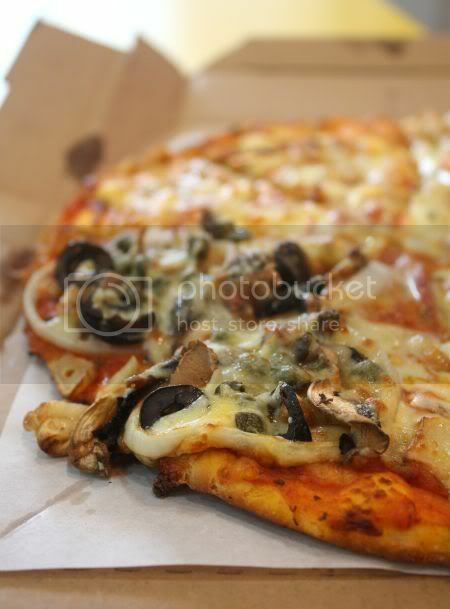 For those who love capers and black olives, the anchovy lovers is a good choice. I found it a bit salty though. We also ordered an extra - twice baked halved potatoes, which came with 6 halves. A bit oily at the bottom of the skins and I felt not much taste as they used beef bacon to top the mozzarella covered potato skins. Overall, we loved the pizzas and the texture of the pizza crust (not chewy) and thin. No soggy bits in the middle with these pizzas, hence we will definitely return for more pizza. For more pictures of the place, click on my Flickr set. NOTE: Revisited on 6 January, 2009: 4 seasons pizza had an uneven thickness crust; one side thin and the other side thick and slightly uncooked. Pizza is a little oily too. I've heard a lot about this place from Splashie Boy, who had dined here before with his office friends. Thus, when we visited Pavilion last week, I dragged him here to check out the place. I love the restaurants at this area - under the roof as its airy and nice to just hang out. Since it was late afternoon, most people were just lounging around and enjoying the weekend. While this place's moniker is Mexican canteena, I found them a bit confused about their identity. 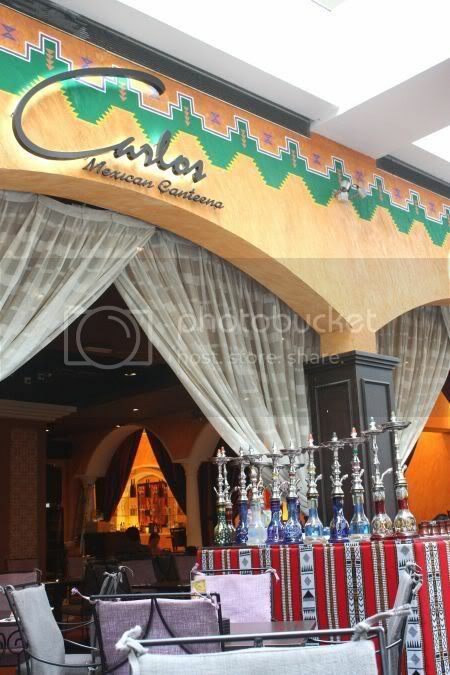 First, the row of shishas or hookas supposedly popular in the Middle East, seems to have found a spot here. Next was the menu dishes served to us. I didn't know burritos (RM19.50++) are served deepfried and with a sauce? Food arrived as fast as we could say Speedy Gonzales. In fact, all our dishes arrived even before our drinks did. I guess it shows, this place is more a bar vs a restaurant, since the bar was so pre-occupied with orders. 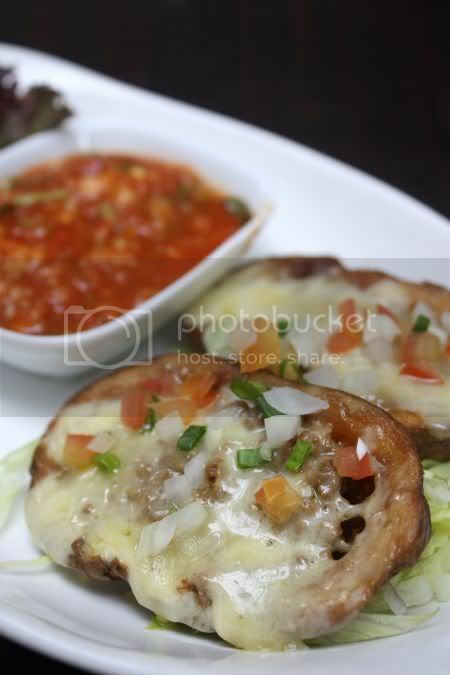 The Mexican Potato Skins (RM10.50++), were good and tasty. A bit soft in the middle but I absolutely loved the tomato salsa it was served with, as it had the piquant taste I liked. Basically I hogged that small plate of salsa and kept ladling it on every bit of my potato skins. Splashie Boy ordered a burrito stuffed with beef (RM19.50++). We kinda expected a flour tortilla wrapped with minced beef but instead, the burrito arrived fried and swimming in a tomato like sauce. 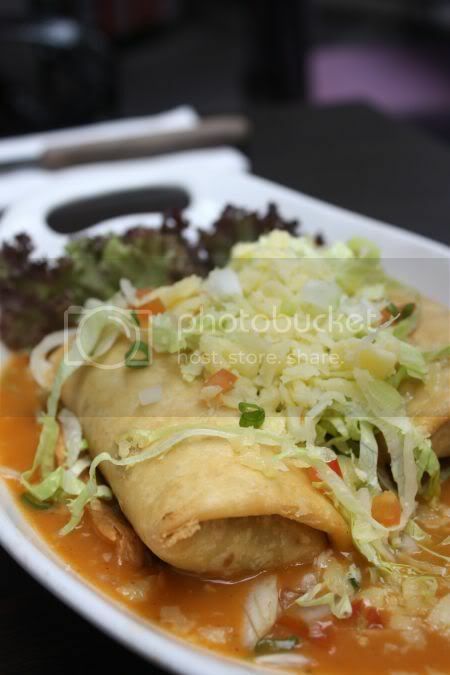 From Wikipedia, I understand this is a variation of the enchilada style burrito, where it is served with a sauce. I thought this version kinda resembled a chimicanga. I didn't like the sauce it came with as it felt quite tasteless (imagine tomato flavoured broth with no taste!). Splashie Boy did enjoy the food but claimed this wasn't what he expected. I went for the beef ribs (RM54++) as I was super hungry that day. The ribs came highly recommended by Splashie Boy's friend. Believe me, it is good value for money as I got a stack of beef ribs with mash potatoes. That stack was so huge, two of us just could not finish it. 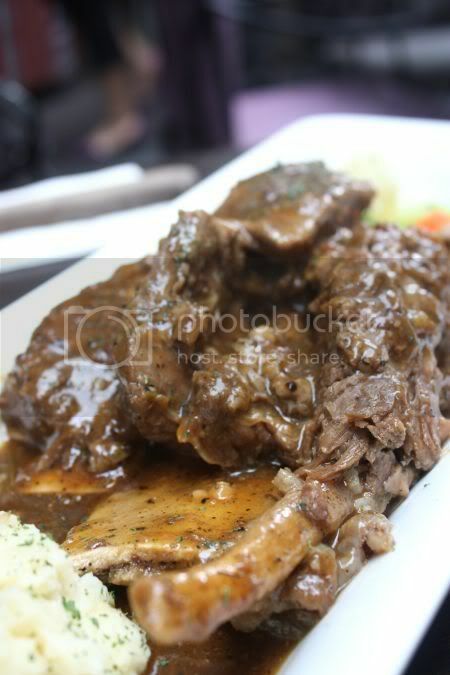 Served with a black pepper sauce, the beef was super tender and falling off the bones. Overall verdict on the food - its tasty stuff BUT not authentic Mexican food. The beef ribs may be pricey but the portions are very worth every sen paid. wait a minute....that's not beer?? Section 17 is THE place for good food - just throw a stone anywhere and you'll definitely hit a stall that serves more than decent food. Moreover, food tends to be cheaper here since their clientele are the university students and senior citizens, who live here. Last week, when I had to attend the funeral, I needed a nice pick-me-up, hence I opted for this place, which I remembered reading from Cumi & Ciki (those two "monkeys" that love food). It was quite late by the time, I headed here for lunch, hence I got the remnants of char siu, which had a nice melt in the mouth texture. The next time, I visited for breakfast, I was luckier as I got fresh from the oven char siu that was so tender, it breaks while you try eating a thick piece (see all those broken pieces when I transferred them from the side of the plate to the middle!). 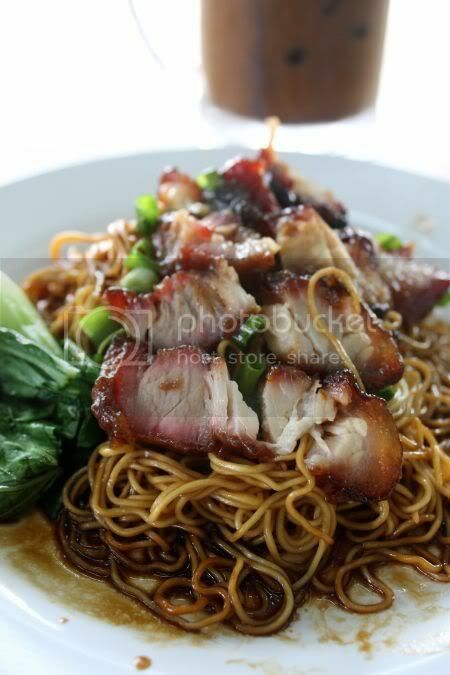 While the texture of the noodles aren't as great compared to K. Intan's wantan mee, (the stall owner admits they don't make the noodles themselves) this is a serious contender for one of the better wantan mee in Petaling Jaya since they score high on great char siu and pretty good wantans. 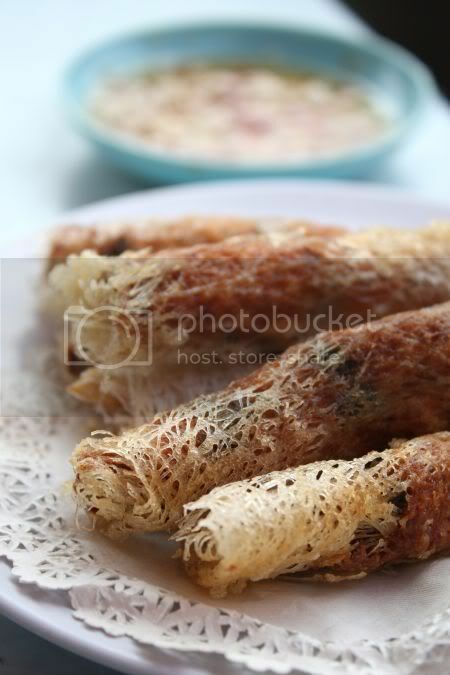 Unlike the limp looking wantans from other places, these babies are packed to the brim with filling and the aromatic dry sole fish (chor hau yee) powder. I even tried their highly recommended dumplings - bursting with filling including 1 whole prawn. While it was not crunchy, it was still a very decent sui kow, that I would not mind ordering again. For those who know Section 17 well, this corner shop used to sell Teochew porridge and at night, there was a fried noodles stall using charcoal fire (they shifted to the other corner at the end of Weng Kee, and opposite the carpark). This place also used to have an exotic meats and soup stall, which became big and successful to expand into Friendship Herbal Shop. The owner took back the shop this year and decided to sell Ipoh White Coffee and open the noodles stall. They also own the yong tau foo and porridge stall. I love the white coffee here too - the foam stays even after I have finished my meal. My newest craze nowadays is making homemade ice-cream. I recently got my very belated Christmas present - an ice-cream maker, hence I have been churning up ice-creams. Not a lot, as the last time, I made a batch, it took a while to finish since I had a bad cough. 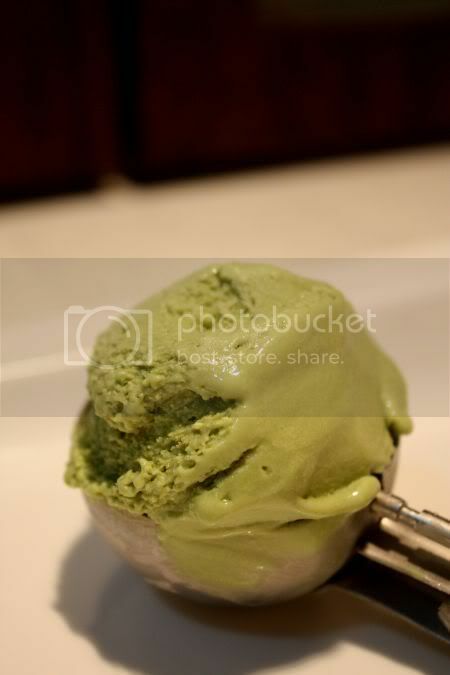 It is my second time making this superb ice-cream - a mix of slightly bitter green tea with creamy decadent white chocolate. Only the best ingredients of course - organic green tea powder brought in from Tokyo (Splashie Boy's colleague got me a packet) and Valrhona Ivoire chocolate. For the first batch, I had problems mixing my green tea paste inside, hence it became more white chocolate tasting. This time round, I spent a long time making sure the green tea paste blended in the mixture, by doing a few rounds of whisking. Most of my friends claim, it was still too sweet (we had a tasting session on Sunday, after a very full meal at Greenview) except one friend, who loves sweet stuff. Maybe the ice-cream was too melted the other day, as when I tried it straight from the freezer, it was not too sweet. I reckon the next time, I'll do away with the sugar portion. One thing I notice about homemade ice-cream, the texture is incredible - super smooth and creamy with very little ice crystals. 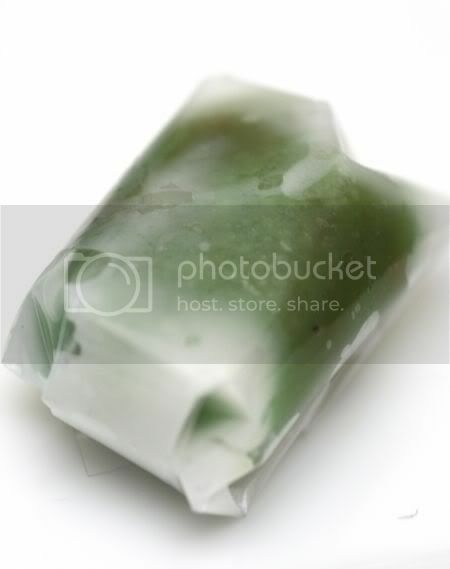 It melts faster though and can't keep forever since there are no chemicals within it. However, a one litre tub never lasts long in the freezer, especially with Splashie Boy who loves to indulge in a scoop once in a while. 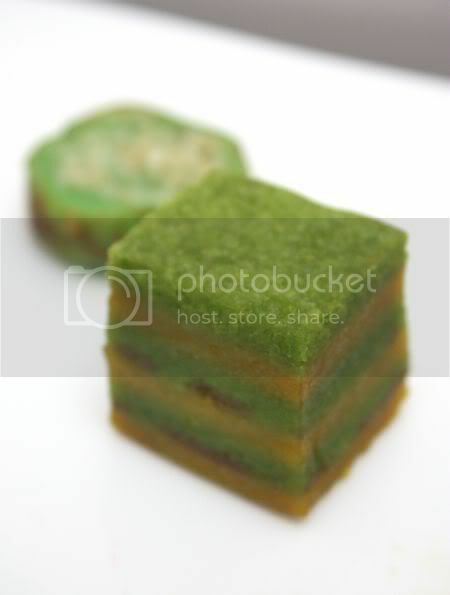 If you wish to try your hand in making your own, refer to Kuidaore's incredible recipe here. Just make sure you blend the green tea paste well. I get bored easily, hence after a couple of days of ho-hum food around the office, I start itching to try something different. Talking about new things (as usual, I divert from today's food topic), I heard an interesting tidbit during lunchtime - Godiva is opening a branch at Suria KLCC (next to CPK aka California Pizza Kitchen). Whoopee! as this means getting those luxe chocs from a decent place versus the KLIA terminal. Also heard that Bukhara has closed and will be replaced by Harrods. I doubt it is the full fledged version - probably just a small place selling jams, biscuits and souvenirs from the ever famous department store. 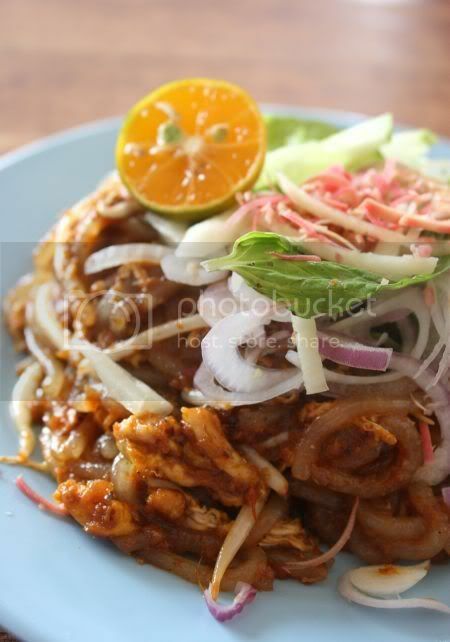 Okay, back to today's food topic, an interesting dish known as fried laksa. Discovered by my colleague who lives in Subang Jaya, this is a dry version of the ever popular assam laksa using all those familiar elements - lai fun, tangy and spicy chilli paste, mint leaves, shredded bunga kantan, cucumbers and onions. Not all the ingredients in the laksa are adopted though as the har koh (pungent prawn paste) and fish slivers are missing in this interpretation. Instead I found boneless chicken pieces and prawns within the fried noodles. I tend to like the spicy and tangy kick of the fried noodles, hence I hanker for this once in a blue moon even though I find it a bit pricey for the size they serve you with. 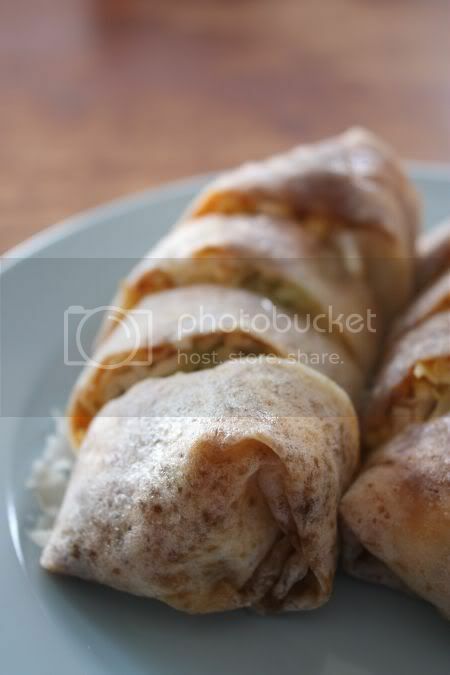 The popiah is something I usually order too. Not fantastic tasting but a decent wrapped version using a pale coloured shredded yambean instead of the brown version. Service is quite fast, and you get to see the workers preparing food in a clean environment as they have an open kitchen. Not much time for food exploring, as I was working on Saturday, but we did manage to squeeze in a quick trip down to Pavilion. I had wanted to check out a place but unfortunately, it was not opened yet. Sigh! As usual the food court was packed to the brim with people, getting lunch. So packed it was, we totally avoided fighting with the crowds for food and space. 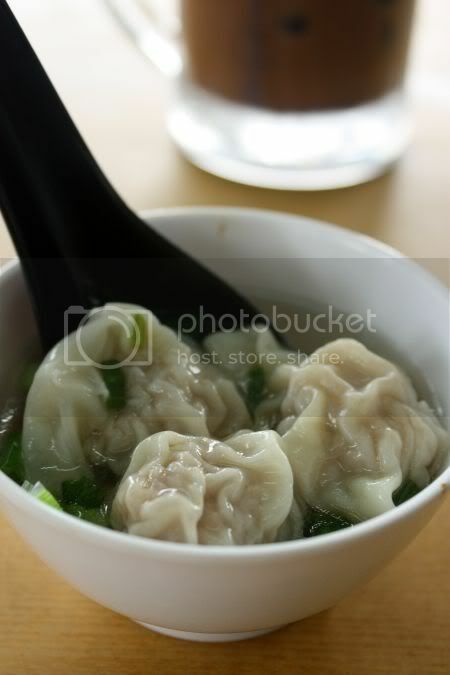 Some changes to the food court, we noticed a new area selling dumplings (pork free ones) wrapped in bamboo leaf i.e. 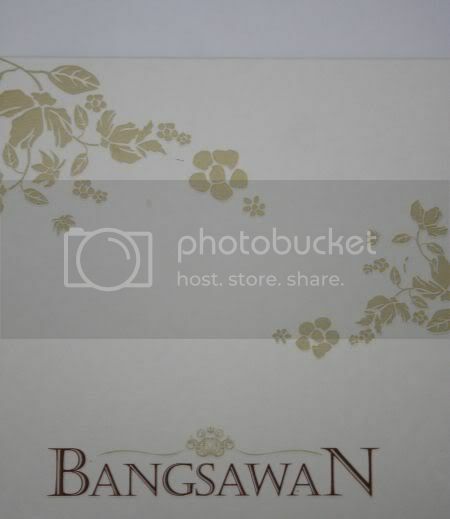 bak chang, Little Taiwan with bubble tea drinks, a Turkish kebab and this Indonesian kuih-muih stall called Bangsawan. 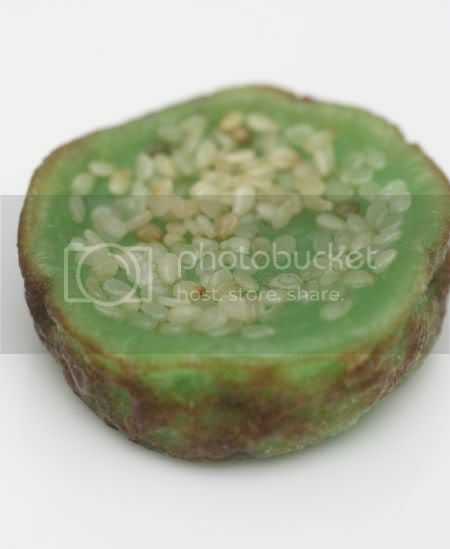 Everything here is a micro-mini version of kuih muih, we often see out in the streets. 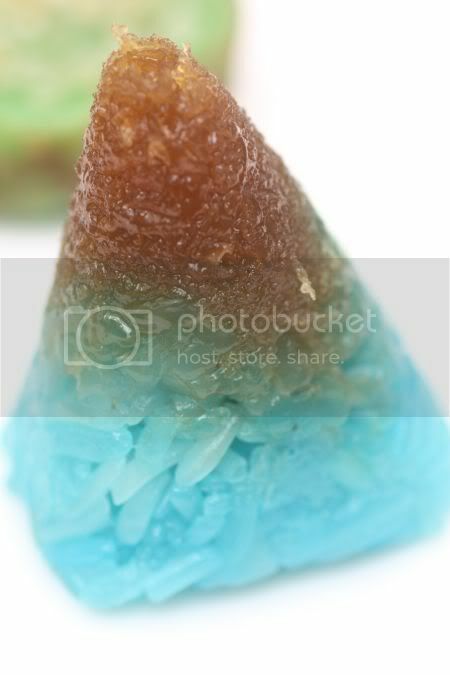 Although they have Indonesian names, most of the tastes are familiar as they bear a striking resemblance to our Malay kuih. Select from the counter, as they have boxes of 9, 16 and I think 24 compartments for you to place all the teeny weeny kuih in. The Singaporeans who were visiting KL, were lapping it all up and buying boxes of it. I guess with their strong exchange rate, these small kuih were all very reasonably priced. We settled for the smallest box to give it a try. 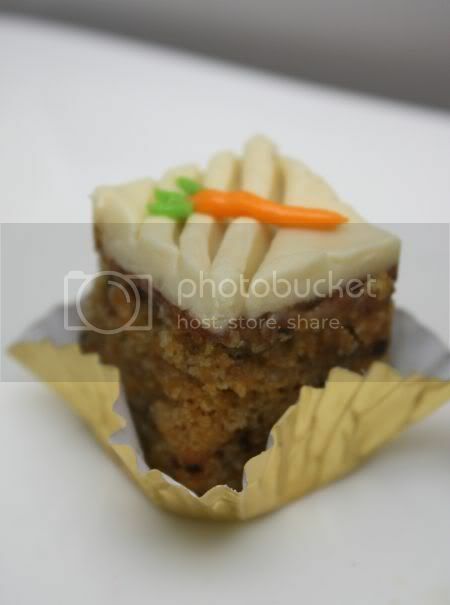 After a photo session with these dainty babies, we sat down and sampled it all. Verdict was they were all very good, made from top class ingredients BUT still damn pricey. However, I reckon they will make excellent corporate gifts for people celebrating Hari Raya. Makes a change from receiving dodol, dates or Patchi chocolates from Lebanon. 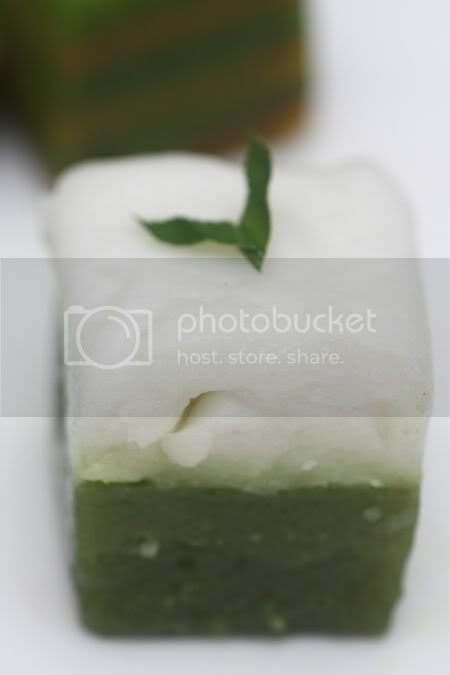 Bingka Pandan (RM1.23) - a very tiny version of kuih bakar. Seems these tiny treats are all made at home. There's also free delivery services within the KL vicinity if you buy more than RM100. You can call or fax 03-21645982, to place your orders. They also make cookies for sale and I also saw other stuff like Talam Rose, Talam Pandan, savoury snacks like Kroket and Lemet. Note there is a 5% tax of the small cakes also. Apologies again, as I have to shelf blogging this week. Sadly, a very good friend's mother passed away on Monday, hence we have been busy with the wake every night and the funeral yesterday. 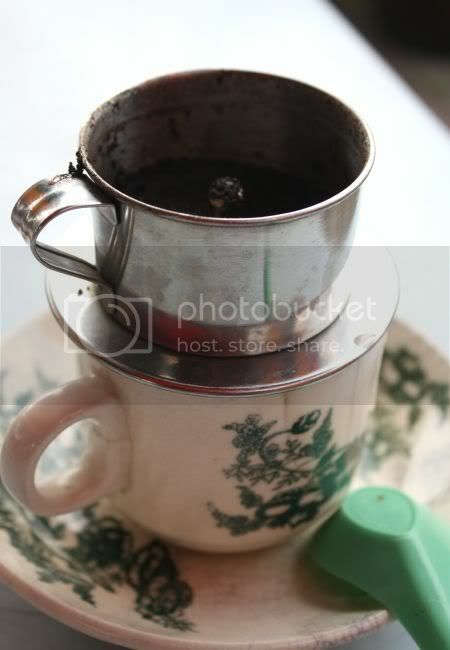 For those, who miss the food, I have uploaded some pixs I took in a recent trip to Kampar. I was guided by ktx, a fellow blogger who gave me such detailed maps and explanations, that my trip was extremely fruitful. So fruitful, that I have still not uploaded all my pixs....in fact these are just about half of what I took, but do have a look at my flickr set. Write ups and details on where to get all this scrumptious food will be coming, maybe during the weekend. 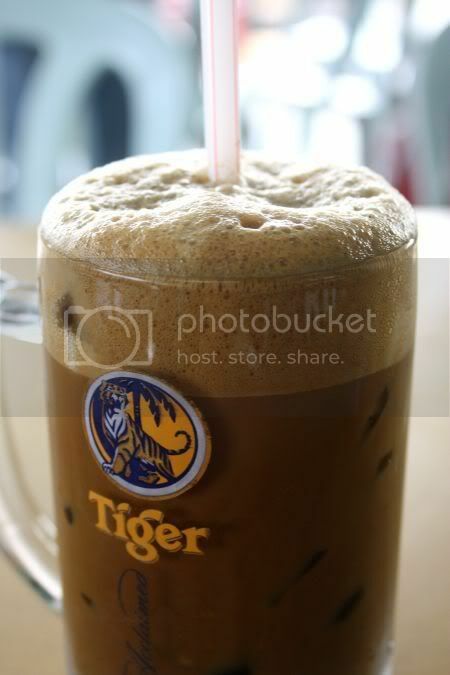 Vietnamese coffee mixed with kopitiam cup - the new fusion?? Sorry for the long absence but I have been fairly busy with work. However, I did manage to step out last weekend for some food exploring. When it comes to searching for new places to eat, I rely on various sources - blogs, tips from friends, the papers and food guides. 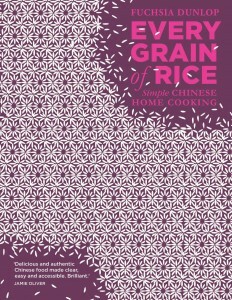 The latest food guide, I picked up from the bookshop, is the Popular Food Guide. Covering places not in their previous year's edition, most of the places in it are quite familiar except this one - a Vietnamese place in Segambut. Feeling adventurous, I decided to target this place. Just a short distance from the ever famous Yu Ai seafood noodles, this place is located within a converted house. A bit confusing, as the place indicated in the guidebook, was the old location as the restaurant must have recently moved across the road. I guess this place must have made its mark on local television, as the owner had pictures of herself with Chui Ling, the lady who hosts that Chinese show that tells you how to spend RM50 for 3 or 5 meals in a day. When I saw those pictures, I was feeling a bit wary as I do remember trying one of the recommended food places from the show, and it didn't turn out great. The lack of service (even though they weren't so full) and the use of Indonesian maids to prepare the food didn't help qualm my fears about the quality of the food. I decided to order the recommended dishes - pork trotter noodles, the Vietnamese deep fried rolls and the coffee. 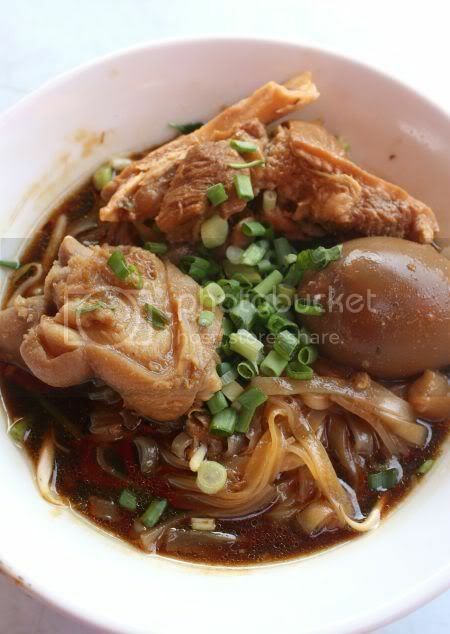 According to the guide, the pork trotter noodles were braised in old coconut juice and garlic. Served with kuey teow noodles, I didn't think the trotters were anything special - tasted just like ordinary trotters in soy sauce. What I did like, was the sambal they served it with, that kinda reminded me of sambal hae bee (dried shrimp sambal). That added a bit of oomph to the noodles. I scored better with the Vietnamese rolls - deep fried and wrapped in a netting, these were delicate, filled with minced pork and great with the garlicky and chili dip. Together with aromatic Vietnamese coffee, I thought the food was only average tasting, and frankly, a bit pricy - RM3.50 for the Vietnamese coffee (not filled the brim even! 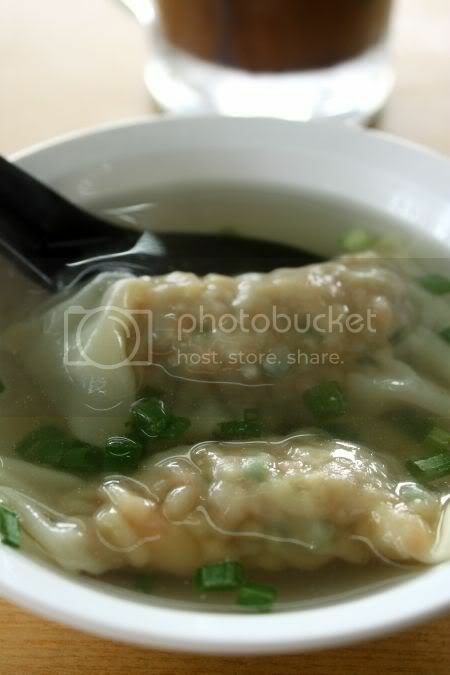 ), RM4.80 for the rolls and RM6.50 for the pork trotter noodles. Not sure if I ordered the wrong things, as when I was leaving the Indonesian lady told me of this delicious tasting crab noodles, she makes on special days. Maybe, I'll get to taste that one day but in the meantime, I think I'll stick to my favourite Vietnamese place in BB Plaza.